TORONTO, ON--(Marketwired - Nov 26, 2014) - As the final days of November approach, many Canadians are starting the countdown to the Christmas and New Year's breaks. The team of experts at Cheapflights.ca, the online leader in finding and publishing travel deals, were curious to find out where Canadians are heading this year. Are Canadians using this year's extra long break for family or fun? To get their answers, the team took a look at the Cheapflights.ca site's travel data to find out which destinations spiked in popularity from searches over the two-week Christmas break. The top destinations reveal a split agenda between escaping to sun and fun versus staying closer to home and family. Looking more closely, however, the team unearthed an interesting trend. Travel leading into Christmas has a decidedly more domestic feel, with Toronto still atop the list and Vancouver, Halifax, Calgary and Ottawa all in the top 10. Fast forward to December 27, though, and the only Canadian spots still on the list are Toronto (now in the bottom five) and ski haven Calgary. Clearly the travel goal has quickly shifted to winter escapes. A few days later, New Year's celebrations top the list, as do slightly closer destinations, whether for sun or city fun. This is the most popular, and for many, stressful time of the year for travel. With crowds, weather, extra baggage and many inexperienced or overwhelmed flyers, mayhem can reign supreme. Get ahead with our tips and advice on how to cope with the uncertainty and chaos of holiday travel -- this toolkit will help you keep calm and travel on this travel season. 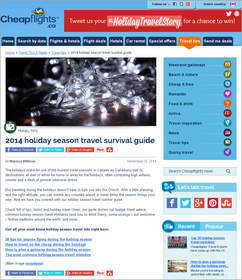 Cheapflights.ca blog post showcasing the 2014 holiday season travel guide. Get ahead with our tips and advice on how to cope with the uncertainty and chaos of holiday travel. This toolkit will help you keep calm and travel on this holiday season.